How can anyone forget the fish market of Mangalore. Fish is a part of daily diet of most Mangaloreans. 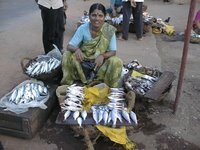 You can find Fish market in each and every area in Mangalore. It is usually under small sheds. More then 10 fisher women sit in the Market to sell their fish. Due to tough competition and bargaining each fisher women will be shouting at the customers calling them to buy the fish from them. It is indeed a noisy situation. Fish is not sold in Kilograms in such markets , it is usually counted. Lets say 4 fish for Rs 10/- (This price was around 10 years back when I edited this article first time). One can find all varieties of fish here from prawns to crabs and fresh water fish. As the demand increases the price of the fish also increases. Sometimes due to bad weather and rough sea you will not get fish for days. This entry was posted in Mangalore and tagged bargaining for fish, boiled rice, crabs, fish fry, Fish market, fisher women, Mangalore, Mangaloreans, prawns, sold in Kilograms, weather in mangalore. Bookmark the permalink.